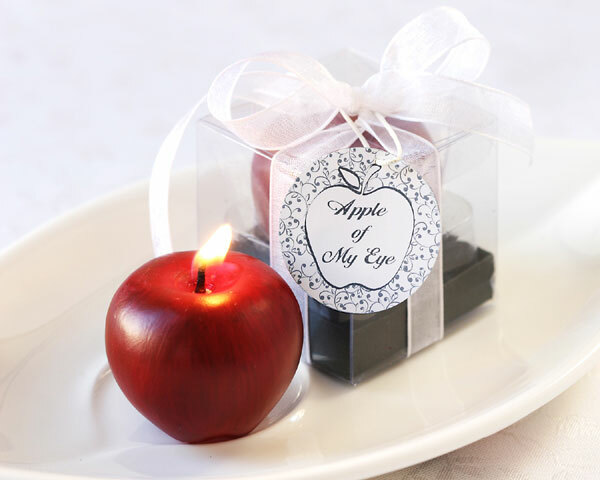 Apple of My Eye Mini-Candle in Gift Box - EconoBride - Budget friendly wedding favors. Sometimes the most charming things come in small packages. This little candle brings a big impact to any event: showers, parties, receptions, when ever! Hand-painted in a deep apple red,the wick is cleverly disguised at the apple's stem. Packaged in a clear showcase box, tied with sheer ribbon, candle stands approximately 1 1/4 inches tall. A standard Apple of My Eye tag is included.